Those games that test your Analytical skills and thinking capacity you possess have always been inn, games such as chess master that test your brain limits of thinking by playing against experts you explore how much thinking capacity you got and are you using it or not?. 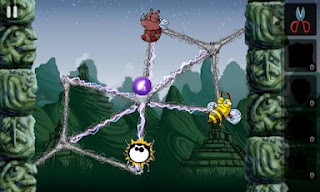 The Android Game we are reviewing at Techtabloids.com has also fallen in the same league that test your thinking power and its limits, the game is Greedy Spider 2 by playing this game you will explore your thinking power. Lots of flies and bugs have been trapped in the web of hungry spiders and Spiders want to kill them and eat them, it’s time for you to save them so there will be peace again in this tiny world. In the main menu of Greedy Spider 2 there are some exciting things that I could not resist to mention, these things will support you while you are playing game. 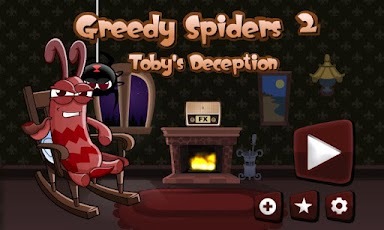 There is one big bug sitting on the chair resting, put your finger on that bug for a little while and the bug will start smoking by doing this multiple times you will earn some extra points, there is another thing a lamp on the right side of menu screen tap on that lamp to turn it on as a result you will get extra points. Remembers these points you can get only one time after that no points can be earned from the methods stated above. Now let’s start from game choose level of difficulty by putting your finger on the gear icon. Now the game starts, as a player you have to cut down the path between bugs and spiders so that bugs can fly away. Now you have started thinking about how to cut down the path? Answer is simple you can cut down the path one by one, by tapping on the web line such as you tap on the web line it will be removed and then the spider will move, it’s like a chess one move from your side and one move from opponent’s side which, is the tricky part of the game that will test your thinking power. Remember one thing that you have to tap to cut down the web not by slashing such as the player does in the games like FruitNinja where you have to slash down to cut the fruits. Greedy Spider 2 is divided into several parts and stages, means there are multiple stages in one part, and some parts are reserved for full version of the game that is paid one. However, in the free version too there are several parts that you can enjoy in free. The more stages you clear the more the web is growing plus further difficult from the previous ones, although if you catch that you are stuck in one stage and there’s nothing you can do to clear that stage so there is a hint option for you which will guide you all through the stage, just press the pause button on the left of the screen and then press hint and it will take your 10 points to give you hint and the hint is that the area that you needed to cut down will be turned down in purple color one by one and you can easily follow that purple points to clear this stage. 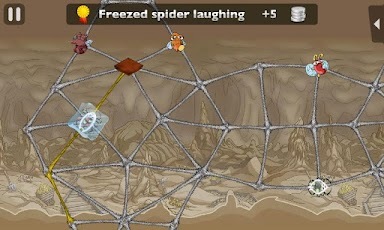 There are several things in this game for Player, such as to earn the ice which can be used to freeze the spiders, an electric bulb which will stop spider as you placed it on the web and many other things that you will find while playing this game. There is a zooming mechanism too in the Android Game Greedy Spider 2 by pinching in and out. Graphics are good, objects and backgrounds are visible and clear, the bugs and the spiders are also clear and especially the sound of the bugs in grief and happiness. Interesting game to play. Will test how strategically correct you are? Must try Greedy Spider 2 if you don’t want to buy then there is a free version of that we have reviewed.